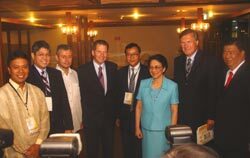 Former President Corazon C. Aquino with liberal leaders. Over 100 leaders from the Council of Asian Liberals and Democrats (CALD), the Alliance of Liberals and Democrats for Europe (ALDE) and Liberal International (LI) convened in the Philippines from June 21 - 24, 2006 for the third joint conference aimed at discussing global challenges and possible responses from the vantage point of liberals in Asia and Europe. The Friedrich Naumann Foundation was one of the initiators and co-sponsors of the cross-continental political forums. Following successful conferences in Seoul (2002) and Brussels (2004), the Philippine event entitled “Migration, Population and the Globalization of Labor” was part of a continuing effort to share ideas and discuss solutions to what Asian and European liberals perceive as one of the major challenges of many societies today. As it has become apparent that migration has created the ground for cultural and religious tensions in several countries – particularly in Europe, the conference participants subsequently discussed the role of religion and the state in managing cultural tensions. Presenting a liberal answer to this challenge, Jules Maaten, member of the European Parliament from the Netherlands, emphasized the importance of tolerance and the separation of organized religion and the state. “The secular state is one of the most authentic liberal achievements,” Mr. Maaten said. He added that in Western societies, we also see a trend that people are looking more for religion. The Dutch politician said that this has to do with insecurities which have arisen in the wake of globalization. “People are clearly searching, and we haven’t found an answer, let alone a solution to this phenomenon,” Mr. Maaten concluded.